I have not tried these recipes personally, as cactus (Opuntia sp.) pads are not generally available in U.K. supermarkets. However, Opuntia species have been introduced and grow in many countries. Do be careful to remove the spines and glochids completely before eating any Opuntia pads. These recipes are only for Opuntia pads and should not be adapted for other species of cacti, some of which are poisonous. Some of these recipes were sent by Dr. Andreas Laras. All opuntia species are edible (non-toxic) but some species are easier to use than others. Two parts of the plant are edible, the pads (nopalitos) and the pear (tuna). The pads are vegetable and the pear is fruit. The State of Texas named the prickly pear cactus as the state fruit/vegetable in 1995. Texas A&M in Kingsville, TX has done extensive work on a cultivar designated as the 1308 which is spineless, resists cold weather and contains less mucilage. While young opuntia pads contain less mucillage, some work has been done on cactus mucilage as a possible dietary supplement to increase soluble fiber intake which has various health benefits. About 40,000 pounds of pads come into Texas each day from Mexico where the are available in any large grocery. They are spineless varieties and are available already washed and diced or as whole pads. The fruits are often made into tuna jelly. Cactus Pads contain large amounts of Vitamin A and C, and also a fair amount of B vitamins and iron. You used to have to go "South of the border, down Mexico way..." as the old song says , to enjoy Nopales or Cactus Pads. Burritos have found their way into our kitchens; so have tamales, refried beans, tacos , and hot peppers. Now we can also enjoy the soft but crunchy, tangy, and silky textured Nopales right here at home. If you do not like the slippery taste of Okra, Nopales may not be for you. If you are willing to sample this interesting vegetable which is often served in Mexico, choose medium sized, firm pads. Avoid purchasing limp dry , or soggy pads. Wrapped in plastic they should keep in the refrigerator for several weeks. But, where ever you are, if you want to try a pad off your Opuntia, just chose a new tender pad of new growth. To clean Cactus Pads, take an ordinary kitchen peeler and remove spines and eyes. Wash well. Trim edge to remove bruised and dry parts and wash well again, washing off some of the sticky liquid the plant exudes, and put it into your favorite recipe. If you just want to taste it, you can dice it up to about the size of small green beans, and simmer in water or saute in butter for a few minutes. Salt to taste and enjoy. Nopales can be eaten raw but are preferred cooked by most people. They can be steamed over boiling water for a few minutes and then combined with other foods. Favorites are Nopales with eggs, added to soups or chili, mixed into tortilla fillings, or even stuffed with cheese and deep fried. Experiment with them and learn to enjoy their unusual texture and taste. Cactus fruit is generally edible, although in some cases it may be dry, woody or otherwise uninteresting. Beware of spines or glochids on some cactus fruit. Echinocereus enneacanthus (Strawberry Pitaya) has edible fruits tasting of strawberries. The small berries of Rhipsalis are quite sweet and juicy. Juicy fruit from several species of cactus (e.g. Hylocereus polyrhizus, H. undatus, Stenocereus queretaroensis) is commonly called pitahaya, pitajaya, pitaya or similar. These fruit are quite nice and sweet to eat, although a little pricey and with no particularly distinctive flavour. They are said to be rich in Vitamin C and water soluble fibre. Fruit from some Opuntia species may be referred to as tuna or prickly pears. The fruit of some species has dark purple flesh and a good flavour. 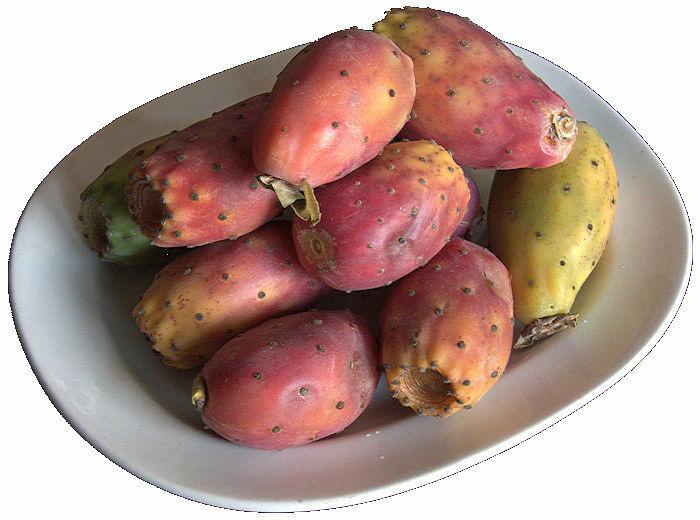 Prickly pears should be scrubbed under running water to remove glochids from the areoles on the skin. 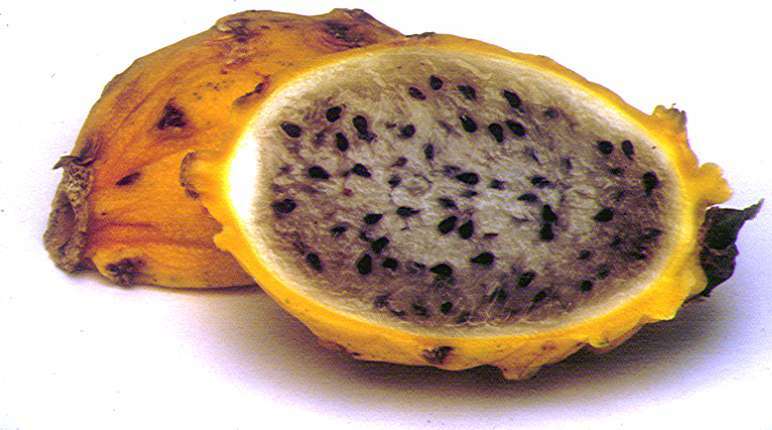 Cactus fruit is farmed and exported from several countries including Colombia, Honduras, Palestine, Mexico and Nicaragua and is sometimes available in European and USA supermarkets. You can grow the seeds too ! This is an interesting treat for a cookout. Scrub cactus leaves well with a vegetable scrubber to remove any spines that may be on them. With the end of a potato peeler cut around the spiney nodules and remove them. Make sure that all are removed. Grill the leaves over charcoal or wood fire for 10 to 12 minutes on each side. Thicker leaves may take slightly longer to grill. Brush leaves with oil occasionally while grilling. Serve hot. Scrub cactus leaves and remove spines. Use a potato peeler to cut around spiney nodules and remove. Slice cactus leaves into bite-size pieces. Saute cactus leaves in a small amount of butter for 5 minutes. Remove. Beat eggs in a mixing bowl and add shredded cheese and cooked cactus leaves. Pour in heated skillet and scramble. Serve warm. Simmer pork in salted water for 2 hours or until cooked and tender. About 30 minutes before pork is finished add prepared nopales sliced into bite-size pieces. Meanwhile, in a blender combine the garlic, jalapenos and some water. Puree until smooth. Peel the tomatoes, remove seeds and chop. In a large pot place the tomatoes, puree, pork and nopales. Add chicken stock and simmer for about 1 1/2 or 2 hours until tender. Salt and pepper to taste. Preheat the broiler. Carefully trim edges and cut the spines from cactus paddles; brush the paddles with 1/2 tsp. oil. Broil the paddles, 4" from the heat source, turning occasionally, until limp, 10-15 minutes. Cool, cut in half lengthwise, then cut each half into 1/4" wide slices. Set aside. Place tomatillos and tomatoes on a baking sheet and broil, 4" below the heat source, until soft and blackened in spots, about 4 minutes. Turn and broil on the other side. Cool; peel the tomatoes. Meanwhile, on an ungreased griddle or heavy skillet set over medium heat, roast garlic cloves and fresh green chiles, turning regularly, until soft and blackened in spots, about 15 minutes. Let the garlic cloves cool, then peel. Lay the onion slices on a piece of foil set on the griddle or in the skillet and roast until browned and softened, about 5 minutes per side. Just before serving, add the reserved cactus slices to the soup and bring to a boil. Ladle into warm soup plates and sprinkle with the toasted chiles pasillas. Serve immediately. Makes about 8 cups, serves 8. For an extra-hot soup, use four to six Habanero Chile's instead of ordinary chile's. This is the best recipe that I have been able to find for cactus jelly / jam. However, it does not appear to be wholly satisfactory and some notes on possible improvements are appended. 2. Peel prickly pears, cut into pieces, and place in a medium-sized saucepan. Cover prickly pears with water and boil at high heat for 5 minutes. 3. Pour boiled mixture through cheesecloth. Drain as much juice as possible and discard seeds. 4. Measure juice. Combine 3 cups of cactus juice, sugar, and lemon juice in a large saucepan or kettle. 5. Bring mixture to a rolling boil. Reduce heat to medium-high, add liquid pectin, and cook mixture for 8-12 minutes, or until the mixture begins to thicken. Skim off any foam that may have formed. 6. Pour mixture into hot, sterilized, half-pint canning jars and seal according to manufacturer's directions. * Prickly pears are fruit from the prickly pear cactus (Opuntia sp.) and may range in color from yellow-green to deep purple-red and in colour in size from that of an apricot to 6-inches long. For this reason, there is no accurate way of judging how many pears it may take to obtain a given amount. ** The acidity of the lemon juice is needed to promote setting of the pectin which combines with the sugar to set when cold. *** Liquid pectin is added because, presumably cactus fruit does not contain sufficient pectin to set. Even so, cactus jelly made in this way may "jell" soon after processing or can take as long as 2 to 3 weeks. Clearly native American people making cactus jam did not traditionally have access to liquid pectin and probably sufficient pectin was obtained either by stewing the peel of the fruit which in this recipe is discarded, for a longer time with the fruit pulp before straining, or from another type of fruit containing pectin. A modern equivalent could be to use green cooking apples, and as a starting point I suggest about an equal weight of cooking apples to the weight of cactus fruit. To test for pectin, put 1 teaspoon of juice into a small glass, allow to cool and add 3 teaspoons of methylated spirit. Shake gently and leave for 1 minute. A jelly like lump indicates that plenty of pectin is present. Lots of small lumps indicate that little pectin is present and that the jelly is unlikely to set unless more pectin or another high pectin fruit is added. **** This step should not really be necessary as a well-made jam / jelly should keep well for months without further sterilisation.